(NaturalNews) On February 27, the Austin City Council addressed agenda item no. 19, an action to authorize and award an extending million-dollar contract with Mosaic Crop Nutrition, LLC, the city’s hydrofluorosilicic acid supplier. The City of Austin, like many cities across the nation, spends millions of dollars on contracts with companies like Mosaic to fluoridate, or pollute, the region’s water supply based on a few inconclusive studies alleging that it protects children’s teeth from cavities. Not only is fluoride unnecessary to prevent tooth decay, but it’s been known to cause fluorosis in children, a condition that changes the appearance of tooth enamel, leaving permanent white stains. The Environmental Protection Agency (EPA) recognizes this condition; however, the agency justifies this side effect by referring to it as a “cosmetic” effect and not an adverse health effect. Mosaic’s very own material safety data sheet reveals the horrendous dangers associated with flourosilicic acid, including being “[c]orrosive to the skin, eyes and mucous membranes through direct contact, inhalation or ingestion,” and it can cause “burns, which may not be immediately apparent.” Contact with the eye can instigate severe irritation, burns and permanent damage, and overexposure tofluoride can result in death. Harvard’s recent study regarding the dangers of fluoride was so convincing that the EPA altered their recommended fluoride levels, lowering them from 1.2 to 0.7 ppm. 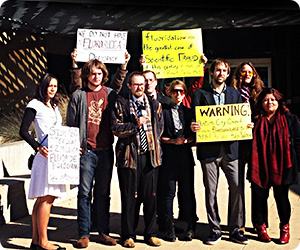 Several anti-fluoride organizations, including Healthy H2O Austin, Fluoride Free Austin, and Texans for Accountable Government (TAG) stood united before the Austin City Council arguing against medicating the water supply with a “one size fits all” dose. Rae-Nadler Olenick, former Public Affairs Specialist for the School of Engineering at the University of Texas, has spent the last six years dedicated to fighting water fluoridation. In 2008, after branching off from TAG, she began leading the organization Fluoride Free Austin. Fellow activist Linda Green joined her in the fight a few months later. Her opposition to water fluoridation included both a health and financial concern. Aside from the city’s half-million-dollar contract with the supplier, tax dollars are expended on distributing the chemical and also on maintenance and repairs. Green condemned the city for not monitoring public health in order to, at the very minimum, study the effects of fluoride; instead, the council relies on dated and arguably inconclusive research from the 1950s. He called the practice “psychopathic” on the city council’s part. Healthy H20 Austin, an organization created last year following a hunger strike carried out by two activists, Nicholas Lucier, 27, and Jason Needham, 25, made their presence known in front of the Austin City Council on Thursday. After five years of presentations to the Austin City Council on fluoride dangers, Lucier felt the “natural progression of civil disobedience” would be to protest through a hunger strike. Lucier, a student majoring in Government, and Needham, an established musician, orchestrated the hunger strike after Needham dreamt of his teeth falling out and awoke with a clear vision. Needham’s vision turned into a 14-day hunger strike that aimed at gaining the Austin City Council’s attention in order to bring the city’s water fluoridation to a halt. We’re here to “[l]et Austin City Council know if they approve this, they’re going to be held accountable for their actions,” said Lucier. “If they cannot uphold the oath of office, then they should not have taken it,” said Lucier. Healthy H20 and their supporters put the city council on notice Thursday after the conference room roared with applause following the speeches of several group members. Still, the city council members looked more lackadaisical than ever, and slightly annoyed while hearing the anti-fluoride arguments. This reaction is most likely based on strong political ties and under-the-table relationships that, if violated, would put them out of a job, or worse. Some speculate the council’s blatant reluctance to discontinue their contract with Mosaic is based on grants the city receives from the Centers for Disease Control and Prevention (CDC). Despite the ruckus made by activists and concerned citizens, the Austin City Council voted unanimously to renew the contract 7-0. However, Mayor Lee Leffingwell could be facing a possible lawsuit after he violated city code and federal law by limiting the speaking time on an agenda item from a legally protected hour and a half, to 45 minutes, cutting 15 people out of speaking time. Healthy H2O plans to readdress the issue next November when the council members are replaced. “This isn’t going to be a whitewash of the previous administration come November, we are definitely going to look into criminal charges, and we’re going to hold them accountable for the negligence they held in office,” said Lucier.